Okay, I get it. You know craft beer. You give craft beer gifts. You go to craft beer bars. You know the difference between the OG and TG ratings on your beers. Untapp’d emails you when looking for new content. Your wheat-fronds-entwined-with-hops-and-barley tattoo makes all the ladies blush. But you have this friend. Let’s call him Bob. Bob likes beer. Bob also likes to draw. Bob would really appreciate your thoughtful gift of a sketchbook for his birthday. But there’s a problem. Bob only drinks ~GASP~ Coors Light. Bob is okay with the fact that you know about craft beer than most people know about their own children, and Bob doesn’t care. “Beer’s beer’s beer.” And yet you still care about him. What to do? Go out on a limb and get him a Ballast Point Victory at Sea book with the great skeleton captain on the front? Would he appreciate the nuances of the design as much as you savor the nuances of the beer? Is that a chance you’re willing to take? The answer is simple…just special order Bob a sketchbook (or journal) with a Coors Light cover on it. You’re a hero, Bob loves his gift, and most of all you didn’t have to drink the Coors to get him the cover. Just start a conversation on Etsy to get started. I literally have hundreds of hundreds of boxes to work with, and trust me, they’re not all Beer Advocate Hall of Famers. One of our more interesting custom requests. But maybe I’m not looking for craft beer gifts…then what? 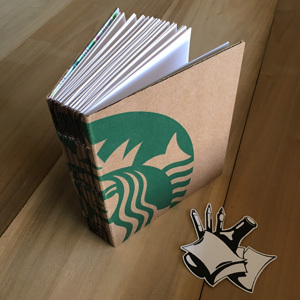 Journal made out of a Starbucks Traveller box. First of all, I would wonder how you landed on this site. Secondly, I can absolutely help you with that. Some of our cooler designs haven’t been beer boxes at all, but Krispy Kreme Donut boxes, Mac and Cheese, or even a Starbucks Coffee box have come across this table. 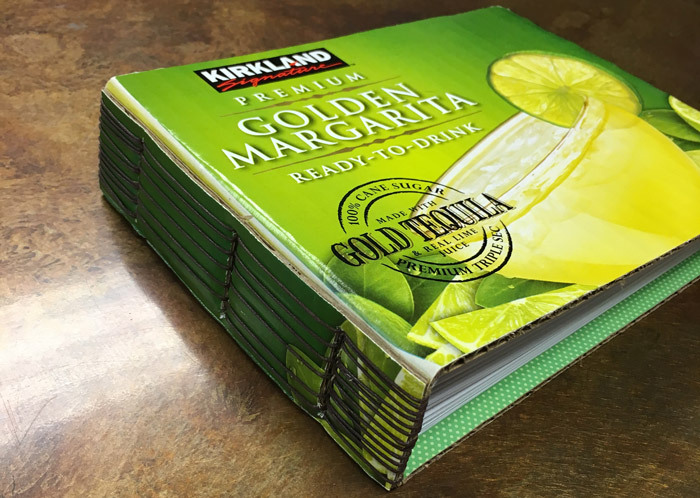 If it’s cardboard, and you like the design, we can make a book out of it! Just start a conversation today!